Introducing our Pumpkin Catnip Toy AND Catula! We have a FURR-ightingly great offer for you, our private customers and bloggers, just in time for Halloween! Our perennial favorite, the Yeowww! Catnip Pumpkin has arrived, stuffed with the freshest, best quality catnip around, at a 15% Savings! Order six (6) Pumpkins and you’ll get an extra Pumpkin Catnip toy FREE with your order! Our cats love the Pumpkin – they grab it with both paws and deliver their notorious “bunnykicks”. The Pumpkin also makes a great little gift for your favorite cat lover’s kitty. We’ll ship it anywhere, including internationally. 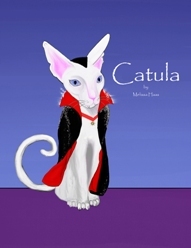 While you’re visiting our site, click to see our Halloween book, Catula: The Misadventures of Dracula’s Cat. This book is a clever take off on the Dracula theme, with a unique twist – Catula! Since we’re offering discounts, we’ll also extend to you a 15% discount off the retail cover price of Catula. Important: To get the 15% Pumpkin and Catula discounts, simply type in the word pumpkin in the promo code box at checkout and then click UPDATE. (Note: You must enter the word pumpkin in the promo code box and click UPDATE in order to get the discounts). This offer is for our private customers and bloggers only. It expires on Sunday, October 7, 2012, so please act now. Happy Shopping! Posted on September 23, 2012 Categories UncategorizedTags cat accessories, cat toy, catnip toy, Catula, Catula the book, halloween cat toyLeave a comment on Introducing our Pumpkin Catnip Toy AND Catula!